Minigolf & Bowling - Top Fun and Friendship! 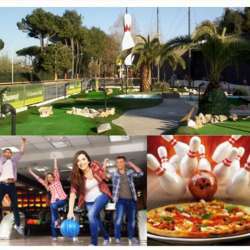 You must be a member of the Rome Bowling, Table Tennis & More Group to attend this activity. Would you like to join this group? Attendance is FREE for Albatross members. After meeting (waiting maximum until 17:15) we'll reserve the minigolf, the bowling match(es), reserve tables for dinner and start the fun! PS. You can reach the bowling by car (free parking) or bus n.982, recommended planning a pick up with hosts or other members or using your car.